Following All Creatures Great and Small, All Things Bright and Beautiful continues the warm hearted autobiography of James Herriot and his adventures pre-World War II in the Yorkshire Dells. A struggling vet, now made partner in the practice, Herriot uses this volume to capture some of the greatest joys and biggest struggles in his life along with the heartwarming and often hilarious animal stories that have long captured the hearts of readers. Now married to Helen, James looks back on their courtship intermittently with a nostalgic longing that peppers the book. No longer so chronological, the story instead captures the movement of memory. We oscillate between farm cases and veterinary challenges, to remembrances of James and Helen’s first homemaking experience, to the impending shadow of World War II. Each page is filled with unforgettable stories: Granville Bennet and his delectable wife Zoe are back in full force forcing booze on an overfull and sickly James. Clancy appears with his “womitting” wolfhound and Siegfried sets Tristan the task of diagnosing the horrible hound. Helen sends James on a practical household errand for some much needed furniture and instead he buys a heavy set of moldy encyclopedias which stink too much to be stored in the house. Widow Dalby struggles to keep up her farm after her husband’s passing, reminding Herriot of the respected solidness of the simple, yet kind Yorkshire farmers. Tristan scares up the Raynes’ ghost for some practical joking and gets what Herriot finds a very just come-uppence. James meets a real life crazy-cat lady and attempts to treat her vicious feline Boris resulting in some side-splitting house destruction. Devoted Frank Metcalfe, city slicker seeking a career in farming, has all that it takes to make a go in the hard world he has sought, yet circumstances slowly destroy him leaving James melancholy. Siegfried dramatizes one of his angelic forgiveness routines to the forgetful James and Tristan, who persist in leaving farm equipment behind, only to end up caught out himself for his bad memory, and much more! Each chapter is a vibrant, short burst of life, capturing all the love of wide open pastures, honest and hardworking people, and a cozy village atmosphere. James has his challenges, some quite serious and others decidedly comical, but above all the spirit of optimism continues to shine from each page. There are difficult clients, uppity colleagues, and small tragedies that keep the narrative effecting and real without ever overcoming what James admires most: the spirit to persist and remain cheered by life’s simple joys. Whether it’s taking a break in-between rounds to sit and watch the beauty of the landscape, puzzling through a complicated case, building his new home and life with Helen, or participating in the brotherly antics between Tristian and Siegfried, the distinctive sense of hope, gratitude, and aliveness that made the first book so impactful continues here. In the conclusion, a war looms and Herriot leaves for the RAF, a pregnant Helen temporarily returning to her parents. Siegfried and Tristan too are drawn into the war, and the friends have one last night together, reminiscent of the old days, staying and talking into dawn. 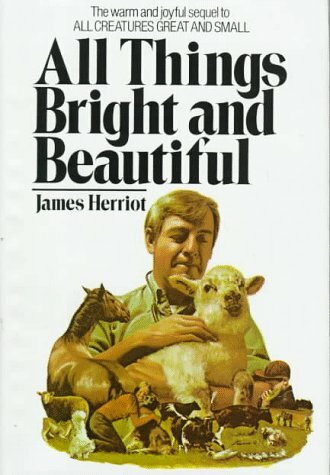 In the conclusion the inspiring humanity of Herriot and his ability to deliver the perfect tale, evoking long cherished memories and the blissful feeling of embarking youth, compel readers to continue with the beloved stories and follow Herriot into war in his next book All Things Wise and Wonderful.